this valentine cake. she gets me. these paprika parsnip fries. the photos! this almond milk caramel sauce. so making it today. this lemon meringue french toast. are you kidding me? this molten chocolate banana bread. as if banana bread couldn’t get any better. this honey roasted peanut butter banana cream pie. dying. this roasted garlic spread. so buttery. these chocolate coconut sundaes with macadamia caramel. she’s so darn creative. these come fly with me cookies. PRECIOUS. this chickpea lemon miso soup. so comforting. this blueberry lemon dutch baby. craving citrus these days… want. this blood orange buttermilk pound cake. stunning. this pepperoni pizza hawaiian bread. omg. these spiced fish tacos with chipotle cream. GAH. these raw chocolate truffles. so many flavors! Spicy Mini Meatball Grilled Cheese. Creamy Parmesan White Bean Stew with Spicy Greens. Thank you, thank you for highlighting the best of the blog world each week! 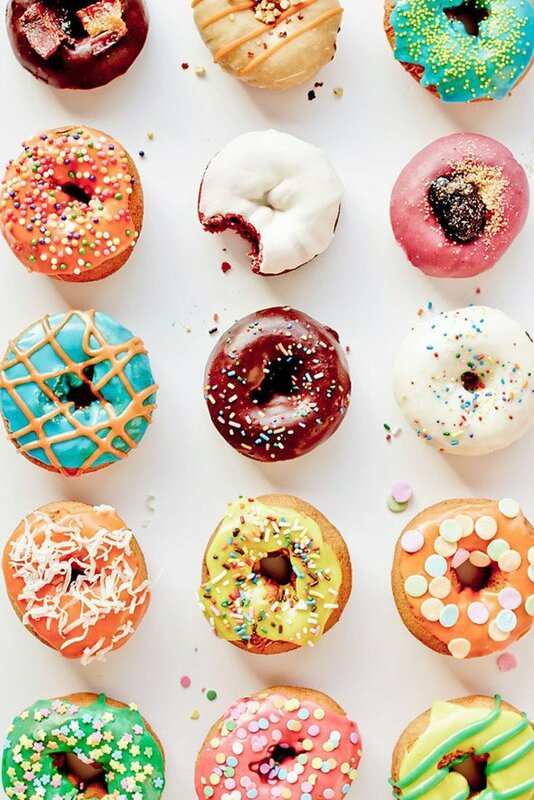 :) love the new pictures these colorful donuts are so cheery! ohmygosh. that molten chocolate banana bread, i must make it nowww! I love that donut pic! And so many great links. Saw many of them already but half are new to me! Thanks for the great finds! GET IT ALL IN MAH BELLY. ALL OF IT. Now i’m off to make chocolate sundaes with macadamia caramel :) <- highlight of the weekend perhaps! Oh, that cake with the little gif at the end, scooping right into it?!? And love that donut picture!!! Thanks for the cookie love! Happy weekend! I think I gained ten pounds just going through this list. This was very good week!! Those doughnuts are so gorgeous!! What are they/where are they from?!? Oh loving the picture of the donuts! I so desperately want to take a bite out of each and every one of those doughnuts. No regrets. Also, those chocolate coconut sundaes with macadamia caramel and the molten chocolate banana bread are rating pretty high on my ‘need to eat’ list. I want all of it as usual! These sound amazing! I love molten chocolate banana bread. Do you have a suggestion for a GF substitution for the flour? I can’t wait to try making these. I spy a red velvet donut…are you kidding me?! I love these posts because I always find fun new blogs and ideas!